Subaru is growing by leaps and bounds nationwide, but thanks our unpredictable weather, New England has long been one of their strongholds. 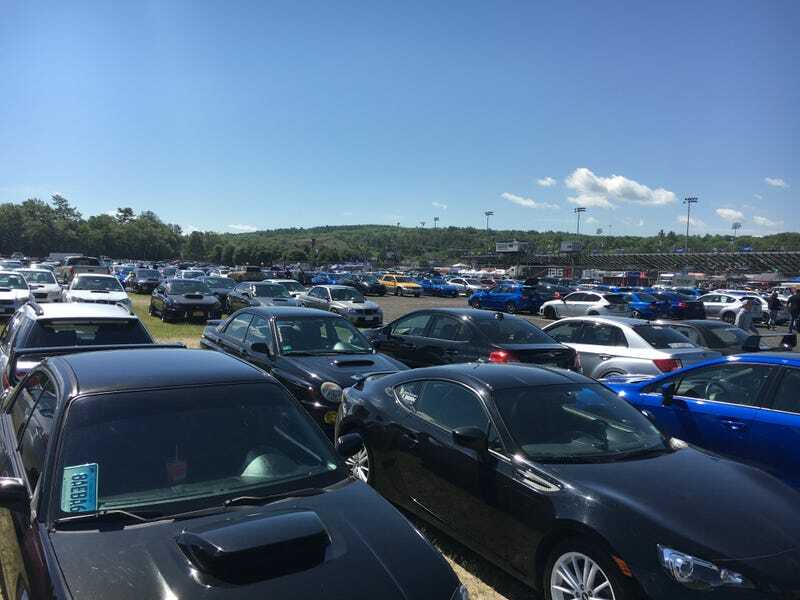 Similarly, each year Subaru of New England holds the largest Subaru gathering in the country - the aptly named Wicked Big Meet. A couple of weeks ago I found myself behind a Subaru Forester on the way home from work. Stickers, such as “Real Women Use 3 Pedals,” made it clear that there was an enthusiast behind the wheel, as well as her thumbs up when she saw and heard my BRZ behind her. Once traffic cleared we enjoyed the twisty back road we were on until we caught up to stopped traffic once again. She stuck her head out the window and asked me if I was going to Wicked Big Meet. I hadn’t decided yet, because we’re closing on our house soon and I wasn’t sure of my schedule. She said it was a great event and highly recommended that I go. Later, after telling my wife about this, she wasn’t jealous of my chat with Forester Girl. In fact, she agreed, and practically ordered me to go out and have a good time. So I went. With over 6,300 attendees, this event is genuinely wicked big. I met up with a group from the 86 Owners of New England to cruise over to Stafford Speedway together. We were promptly split up and spread all over the lot - so much for group parking. But the parking lot alone is worth a wander, just to see all of the different cars modified in different ways. This is the first time I haven’t been able to just look for “the blue BRZ” and find my car. After entering the gate, the first car that caught my eye was the BRZ Series.Yellow. I already wrote about it, so I won’t dwell on it here. I do like the new lights, though. And though lacking the 86 logo inside the headlights of the Toyota 86, there is a subtle BRZ logo on the headlight projector. 2011 was the first year Subaru set a record for a car around the Isle of Man TT Course, and this is the car that did it. Ironically, 2011 was the year my friend Kate actually went to the Isle of Man TT, and saw this car doing its thing on the course! I made sure to send her a picture of it. A rare, iconic 22B was on hand as well. This was a 1998 WRX STi with a 2.2 liter motor instead of the standard 2.0 liter, widebody fenders, and WRC inspired bumpers and rear wing. Horsepower was rated at 276, just like all of the Japanese greats in that era, and was undoubtedly much higher. I’d never seen one of these outside Gran Turismo before. And then I met my hero. I first became interested in rally in the 1990s (yes, that dates me a bit – now get off my lawn). Subaru vs. Mitsubishi was the Chevy vs. Ford rivalry of rally, and one of Subaru’s top drivers at the time was Colin McRae. His flamboyant “when in doubt, flat out” driving style and the distinctive boxer rumble of their cars won me over to the Subaru side of this rivalry. He is my all time favorite racing driver. His untimely death in 2007 means that I will never get to meet him personally, but meeting his 1998 WRC car is just about the closest I can get. I was more star struck by this car than by actual GRC driver Bucky Lasek signing autographs nearby. Finally I moved on from the official Subaru booths to the vendor area. Everyone who was anyone in the Subaru tuning scene was here. I’m not sure if Cody of Cobb Tuning was manning their booth, but it was so busy that I didn’t stick around long enough to ask. I know they don’t make parts for my BRZ anyway (and, if you heard the podcast, you know there’s a reasonable explanation for this). Though it’s technically not a Subaru, the beating heart of a WRX powers this Factory Five 818. Vintage models, like this 1976 Subaru wagon, were well respected as well. I particularly liked this Brat’s blending of the old and the new – not that I have a thing for World Rally Blue with gold wheels or anything. And yes, it’s still equipped with jump seats in the bed. I need to get my hands on one of these for my car as a friendly reminder. Stafford Speedway is a small paved circle track, and each year there is an all Subaru autocross competition on it. Forget about complicated SCCA classing – you’re either Non-Turbo, Turbo-Street, Turbo-Prepared, or BRZ/FR-S (and presumably, in the future, 86 as well). Unlike an average autocross, only half your day needs to be committed to this one. This works well, since I was able to see pretty much everything else in about half a day. Circumstances prevented me from entering the autocross this year, but next year I’d like to give the BRZ/FR-S/86 class a try. There’s also a car show for those who are into looks more than competition. It’s all good – there’s something for everyone at Wicked Big Meet. I’m glad that Forester Girl encouraged me to go to Wicked Big Meet. I’m also glad my wife basically threw me out the door, not for talking to Forester Girl but to go out and have some fun for a day rather than obsessing about house stuff. I didn’t see Forester Girl or her car there, but that’s OK. Next year no one will have to encourage me to go to Wicked Big Meet. Where do I sign up for 2017?